Ukrainian immigrants welcomed home after experiencing the horrors of the civil war in Donetsk. 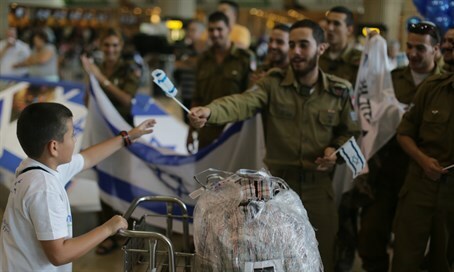 172 new olim (immigrants) from Ukraine landed in Israel on Monday, many of whom are starting a new life after experiencing the horrors of civil war in the Donetsk region. Among them: Igor, Tatiana and their daughter K (her name and their surname are not publicly published due to security reasons). Three months ago, K was captured by Russian separatists for 41 days. "Quite frankly, though all this time we lived in Donetsk, I did not get the severity of the situation until it happened to my daughter", said Tatiana, K's mother, before boarding the flight. As K was a captive, she was imprisoned in a metal box instead of a cell. According to Tatiana, her daughter's only sin was having pro-Ukrainian opinions. K made her Aliyah while pregnant, intending to give birth in Israel. K and her parents plan to reside in Haifa. "I'm no politician and I support peace across the world. I do know however that things should not run their course this way. We live in the 21st century, and both sides should come to terms and end this conflict peacefully." Monday's Aliyah flight marks the 11th Aliyah round of the International Fellowship of Christians and Jews (IFCJ), whom has brought 1,400 olim to Israel since December 2014. Among the current group of Olim: 44 are children, 14 of whom are babies; the youngest of them is 7 months old, and the oldest - 84. 16 of the newcomers originate from Luhansk and Donetsk. The most preferable cities for residence are Haifa and Bat-Yam. In light of the financial situation of the Olim, the IFCJ aids them with special grants of $1,000 for each adult newcomer and $500 for every child, in addition to the sponsorship it gives to the flights to Israel. These grants of the IFJC add to the Absorption Basket and benefits given the Olim by the Ministry of Absorption. Prior to their arrival, the IFJC also takes care of the newcomers' families in cooperation with the local authorities, who pitch in by aiding the olim to find apartments and jobs. "Some of the cases we address are very harsh," IFCJ President, Rabbi Yechiel Eckstein, noted Monday. "Without our active involvement in the encouragement of Aliyah from Ukraine and in the assistance to Olim, they would not have made Aliyah to Israel." "It is in our intent to continue the existent efforts in aiding the Aliyah of the Jews of Ukraine and to increase it if necessary," he added.